Despite the 9-day break between gameweeks 23 and 24, there has been little to no rest for England’s footballing elite over that period. This break from Premier League football opened up the schedule for the second legs of the League Cup semi-finals and the fourth round of the FA Cup, which saw a considerable number of Premier League clubs crashing out of the tournament. Before focusing on gameweek 24, we’ll provide a simple overview of which Premier League outfits are still active in the domestic cup tournaments, as this will start having a considerable impact on the inevitable blank and double gameweeks later on in the season. For more information on the impact of all cup proceedings on FPL, do check out Ben Crellin’s Twitter account (@BenCrellin). The League Cup final is between Manchester City and Chelsea, which means the fixtures of these two teams in gameweek 27 (Everton vs Man City and Chelsea vs Brighton) will be postponed (Everton vs Man City to gameweek 25, the other game is still to be decided). The Premier League clubs qualified for the fifth round of the FA Cup: Chelsea, Crystal Palace, Manchester City, Manchester United and Watford. (Chelsea were drawn at home to Man Utd in the 5th round whilst all the remaining EPL clubs avoided each other). The Premier League clubs with a replay to come to qualify for the fifth round of the FA Cup: Brighton (away to West Brom), Wolves (at home to Shrewsbury). The team in form is first up. Ole Gunnar Solskjaer had a more than reasonable fixture list to start his interim job at United with, so consecutive victories over Cardiff, Huddersfield and Bournemouth in his first three matches were, for many, no reason yet to jump on the United bandwagon. Not an unwise kind of reasoning, but it’s a few weeks later now and United have still not been beaten under OGS: 8 games, 8 victories, including a 0-1 away victory over Spurs in the League and a 1-3 away win over Arsenal in the fourth round of the FA Cup. The Red Devils’ calendar for the coming weeks: Burnley (home), Leicester, Fulham (both away), Liverpool (home), Palace (away), and Southampton (home). The Solskjaer-effect might just continue to fizz for some time to come. Probably one of the most interesting features of the FA Cup’s fourth round was the Chelsea debut of AC Milan’s Gonzalo Higuain. 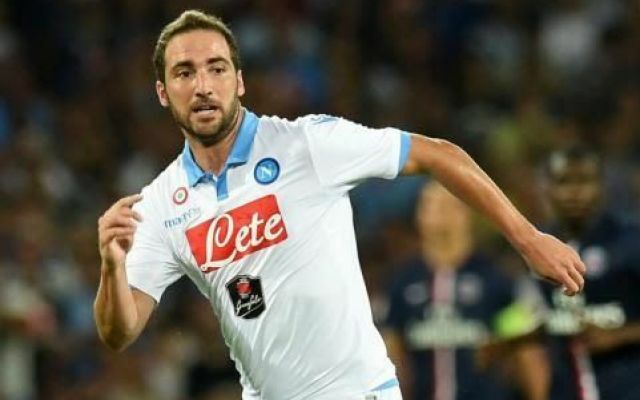 The veteran Argentinian striker, who successfully starred under Chelsea coach Maurizio Sarri at Napoli, was brought in to solve the club’s ongoing issues with the number nine position. Neither Oliver Giroud nor Alvaro Morata (who has now joined Atletico Madrid) are cutting it up front for the Blues, so Higuain immediately started against Sheffield Wednesday. In his 82 minutes of playing time, he made clear that he came to Chelsea with objectives, to score goals and weigh on enemy defences, but what became even clearer once more is that the Londoners have a supply issue more than anything else. Of course, Sarri started a team that was changed in six positions, so that doesn’t help the team’s cohesiveness. It’ll be interesting to see if and how the Argentinian will adapt to playing for his new club in the coming weeks but the initial signs are promising. At the moment, just five Premier League clubs have qualified for the fifth round of the FA Cup, while two more (Brighton and Wolves) need to get through a replay in order to qualify. One of the qualified teams is Watford, who beat Newcastle in the fourth round with a completely overhauled squad. Rather quietly, the Hornets have become one of this season’s outstanding performers due to their excellent results in the FA Cup combined with the club’s current seventh position in the League. The fact that coach Javi Gracia not only could, but also dared to field eleven players that usually don’t start is proof of both the depth of the Watford squad and of Gracia’s trust in all of his players. Thanks to the excellent performance in the League so far, Watford can permit themselves to shift the focus to the FA Cup from time to time, which turns Watford into an outsider for the title. As far as the Premier League is concerned, Watford are facing Brighton (away), Everton (home), and Cardiff (away) in the next five gameweeks, so points are on the cards in that sense as well. Finally, Tottenham Hotspur are having a tough start to 2019. Even though in-form man Heung-Min Son has returned earlier than expected from the Asian Cup, star players Harry Kane and Dele Alli are still out injured for some time to come. The Spurs’ record over the past five weeks is proof of this: eliminated in the League Cup semi-finals (two legs) against Chelsea, a victory (vs Fulham) and a defeat (to United) in the Premier League, and eliminated by Crystal Palace in the fourth round of the FA Cup. The season has taken a bit of a dramatic turn for Tottenham, but they have three home games coming up in the Premier League now (Watford, Newcastle, Leicester) to boost their confidence before the double Champions League clash with Bundesliga leaders Borussia Dortmund, in between which an away game at Stamford Bridge and a home game against Arsenal are sandwiched. It’s essential for Mauricio Pocchetino’s men to get through this period well if they still want to have anything to fight for towards the end of the season. Our first premium pick of the week is Manchester United’s Paul Pogba (£8.7m). The on-fire offensive midfielder has scored 5 goals and provided 2 assists over the past gameweeks, while he also created another 4 big chances for his team mates over that period. In a tough match at home to Brighton in gameweek 23, the Frenchman was instrumental by scoring the game’s first goal, which resulted in 1 bonus point for his FPL owners. His total ownership has crossed the 40% threshold, which is not surprising given the fact there are currently few to no midfielders in his price range with the same FPL value. Add the upcoming fixture calendar to that (Burnley, Leicester, Fulham, Liverpool at Old Trafford, Palace, Southampton), and Pogba starts looking like a must-have. While Arsenal are still struggling to collect clean sheets on a more regular basis, the Gunners attack is surrounded by a lot less doubt. As focal point of that attack, Pierre-Emerick Aubameyang (£11.3m) has scored 14 goals this season already, complemented by 5 assists. The Gabonese striker has disappointed in terms of FPL in the last two gameweeks, posting back-to-back 2-point returns against West Ham at home and Chelsea at Stamford Bridge. His upcoming fixture list is hard to ignore, though: Cardiff (home), Man City (away), Huddersfield (away), Southampton (home), and Bournemouth (home). In the last five gameweeks, PEA was subbed on late, but he still managed 2 goals and 1 assist, while he created no less than 7 big chances in addition. It looks like a big haul isn’t to far off for Aubameyang. Our third premium pick for gameweek 24 might surprise some, considering the injury nightmares and recent run of disappointing results for Spurs, but Christian Eriksen (£9.4m) could prosper over the coming weeks. The big question surrounding the Danish playmaker is how deep he’ll be playing during the upcoming home game against Watford. With Lamela, Son, and Moura back in contention again, Pocchetino might decide to position Eriksen in a deeper playmaker role, but don’t forget that the Dane will be on most, if not all, set pieces. With Kane and Alli out of action, Spurs will be more dependent than ever on the creativity and output of their playmaker. He’s in excellent form (2 goals and 2 assists in the last five gameweeks) and he sat out the lost FA Cup fourth round tie against Palace, so Eriksen will be full rested to face the Hornets at Wembley. When a player scores 2 goals in the two consecutive gameweeks and his ownership lies under 1%, he’s more than qualified to feature as one of our weekly differential picks. This is the case for Southampton’s James Ward-Prowse (£5.0m), who’s been in great form of late. The Saints are currently on a 3-game unbeaten streak (a 0-0 away draw at Stamford Bridge, a 1-2 away victory over Leicester, and 2-1 home victory over Everton) and the English midfielder is rapidly becoming an essential part of Ralph Hasenhüttl’s tactical plan. He’s brought home 21 FPL points over the past three gameweeks for his owners, and with encounters against Palace (home), Burnley (away), Cardiff (home), and Fulham (home) over the coming five gameweeks means JWP, who takes an excellent free-kick, will get more chances to add to his tallies. After a rather unimpressive start to life in the Premier League, Wolverhampton’s Diogo Jota (£6.0m) seems to be on the way to once again cementing a starting spot in Nuno Espirito Santo’s team. Of course, Jota’s incredible hat-trick and subsequent 19-point haul have placed the Portuguese midfielder in the spotlight and no manager can realistically expect similar outputs from him on a regular basis, but hear us out. Jota was injured between gameweeks 18 and 21, but in the three weeks before his injury, he was on a great run: 3 games, 2 goals, 2 assists. An additional upside to Jota, besides his form and his attractive price tag, is that he’s listed as a midfielder, but often acts more like a forward for Wolves, in tandem with Raul Jimenez. The coming fixtures for Wolves are West Ham (home), Everton (away), Newcastle (home), Bournemouth (away), Huddersfield (away), and Cardiff (home). For further ideas have a look at the FISO Forum GW24 transfers topic. Liverpool’s Momo Salah (£13.5m) is unavoidable as a captaincy candidate. The Egyptian has been simply incredible again this season. In reference to his past six gameweeks in the Premier League, Salah scored 6 goals and with 3 assists, while he also created 7 big chances. Over this period of time, he brought home an amazing 64 FPL points for his owners, which equals to more than 10 points per game on average. Over the coming eight gameweeks, Liverpool are facing just one opponent from the top six (Man United at Old Trafford in gameweek 27) and it’s common knowledge that Salah performs best against non-top six. This week, Leicester are coming to Anfield, and the Foxes have lost five of their twelve away games so far this season, conceding 17 goals in the process. The Reds, on the other hand, have won ten of their eleven home games (1 draw) and scored 31 goals in those games. There are a few good captaincy candidates this week and Salah is among them. Our second pick for the armband and final pick for the week overall is Manchester United’s Marcus Rashford (£7.3m). Since the arrival of Ole Gunnar Solskjaer at Old Trafford in gameweek 18, the young Englishman has scored 5 goals and provided 2 assists, resulting in a total of 46 FPL points. He has also created four big chances over the past five gameweeks. Next up are Burnley, who are coming to Old Trafford with a defence boosted by the return of Tom Heaton, but who’ll find it difficult to keep out the red-hot United forward. After that, United are visiting Leicester and Fulham, before hosting Liverpool, visiting Palace, and welcoming Southampton to Manchester. In other words, plenty of opportunities for Rashford to add to his goal and assist tallies. The FISO crowd agree wholeheartedly with Salah as their GW24 Captain with our weekly Poll running at 73% for him currently.